Dialysis patients may have suffered cardiac arrest, in some cases fatal episodes, because of a company’s failure to warn doctors about the risk and proper use of a substance used in the blood-cleansing procedure. The government is investigating whether Fresenius Medical Care violated federal regulations by cautioning its own doctors but not those at other dialysis centers about the potential misuse of Granuflo, which can sharply increase -- by six fold -- cases of sudden death from cardiac arrest. It was estimated that 941 patients had suffered cardiac arrest at Fresenius clinics alone over a one-year period. Others likely suffered similar incidents at other centers as well as ailments such as heart attacks and stroke, in some cases leading to death. About 400,000 Americans receive dialysis, with Fresenius Medical Care treating about one-third of those patients. The U.S. Food and Drug Administration is investigating whether the company failed to inform customers of the potentially lethal risk of Granuflo. 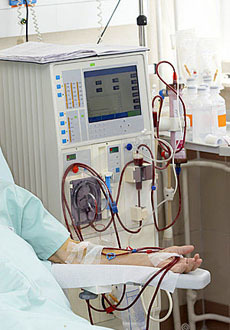 News reports said that in November 2011 Fresenius sent an internal email warning company-affiliated doctors at its own dialysis centers that the use of Granuflo seemed to be contributing to a large rise in the risk of patients dying suddenly from cardiac arrest during dialysis, but that a similar warning did not go to the FDA, other doctors or consumers. That wider warning was finally sent in March 2012 after the FDA got a copy of the memo. It is estimated that 125,000 patients are treated using Granuflo in non-Fresenius clinics. Questions have arisen over whether a failure to warn not only put patients at risk but also violated FDA regulations and ethical standards. The internal Fresenius memo, according to news reports, made it apparent the company was aware of the potential danger, citing 941 prior incidents of cardiac arrest in 2010 at Fresenius clinics alone. How it works: Granuflo, the most widely prescribed dry acid product for dialysis, is used to dissolve acid in the blood. Granuflo contains more of an ingredient than competing products that the body uses to convert to bicarbonate which then neutralizes acid. Doctors who were unaware of the extra bicarbonate contribution from GranuFlo may have prescribed even more bicarbonates – essentially giving patients an overdose. The resulting excessive levels of alkaline, called metabolic alkalosis, can lead to serious heart problems. Kline & Specter, with more than 40 attorneys, five of whom are also highly skilled doctors, has extensive experience in product liability lawsuits and represents injured victims nationwide. At this time, Kline & Specter is no longer accepting claims involving dialysis injury claims involving Granuflo.